The cards of CV Gossip! Into each life some rain must fall, or so the saying goes. Nobody gets through life without getting messed over by Fate and other people. Yet the original game of CV, which attempted to replicate the experience of building a life through the use of cards and dice, left out much of this type of mayhem. CV’s outlook on life was relentlessly rosy. Nothing really terrible happened and you couldn’t even mess with other player’s lives all that much. Needless to say, this wasn’t much like real life at all, although it was fun. 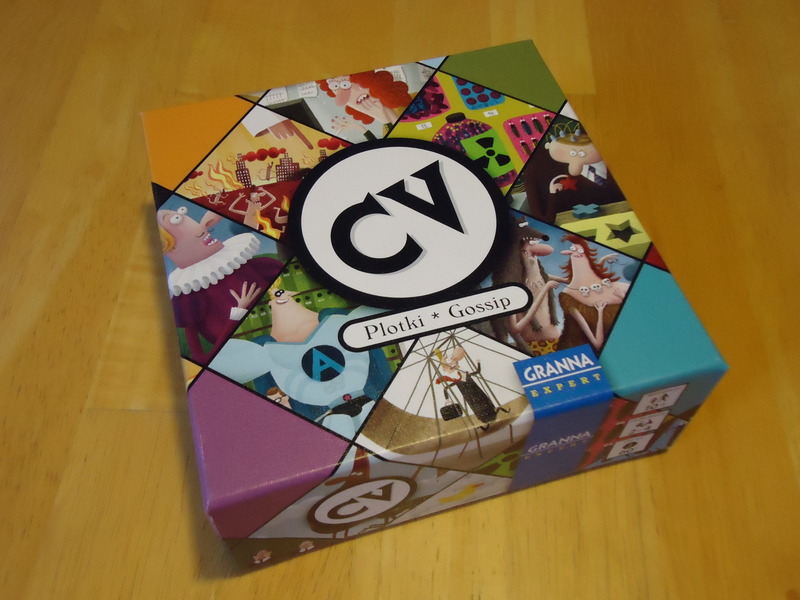 Now, though, we have CV: Gossip, an expansion that attempts to bring a bit of “real life” into the game through new cards. Now we have new goals, cards that we can use to mess with our opponents, new ways to achieve happiness, and cards that help us battle bad luck. Let real life begin! CV: Gossip is a small expansion. You get two new types of cards: Gossip and Fate. You also get an extra score pad, some extra tokens, and two new goal cards. The expansion does not change any of the rules of the original game.You play the game as normal with two minor adjustments to accommodate the new cards. Gossip Cards: Gossip cards are shuffled into their respective early adulthood, middle age, and old age decks at the beginning of the game. They appear in the market just like any of the original cards and can be purchased by paying the associated cost. What’s different about the Gossip cards is this: Gossip cards can be played onto your own CV or onto that of any opponent. When placed on a CV, they are piled into a stack and only the topmost card on the stack is active, just like any of the original cards. For most Gossip cards, the effect becomes active after the player’s turn ends and remains in effect until another Gossip card is purchased or given to you by another player. The newest card then becomes the active card. Some cards specify that they take effect immediately upon receiving the card. Gossip cards count toward the maximum of two cards that can be purchased on a player’s turn, and they cannot be lost as a result of misfortune. They also count when checking whether or not a player should receive social assistance. Fate Cards: Two Fate cards are placed face up near the board at the start of a round. (Since no board extension was provided in the expansion, you’re basically creating an extension of the market.) A player can buy one Fate card on their turn and it does not count against the two card maximum that can be bought on a single turn. Fate cards are bought using good and/or bad luck symbols. Any bad luck symbols that are used to purchase a Fate card are not counted when calculating whether or not a player suffers misfortune. When placed on your CV, Fate cards are piled into a stack and only the topmost card on the stack is active. For most Fate cards, the effect becomes active after the player’s turn ends and remains in effect until another Fate card is purchased. The newest card then becomes the active card. Some cards specify that they take effect immediately upon receiving the card. Fate cards cannot be lost as a result of misfortune. They do count when checking whether or not a player should receive social assistance. Fate cards do not offer victory points on their own, but they can be used to meet one of the new victory point goals in the game. As for the new Goal cards, they are shuffled into the Goals deck and do not have any additional rules associated with them. They are simply there to fluff up the Goals deck a bit. At the end of the game, points are tallied as in the base game. The only change is that each Gossip card in a player’s CV is worth 2 points. The winner is still the person with the most points at the end of the game. Is This The Real World Or Fantasy Land? Having loved the base game, I was really excited for this expansion. I wasn’t unsatisfied by the base game, but I did wish that it was a bit more like The Sims or even the Game of Life in that some more bad things would happen to you. There’s nothing wrong with living in a perfect world, but a bit of mayhem usually adds to the fun of any game that’s attempting to be a life simulation. Otherwise you’re just living in a fairy tale, not a life simulation. So did this expansion give me what I wanted? For the most part, yes. I really like the ability to dump Gossip cards on your opponent. Previously, if you saw that they were building a great engine, the only way to stop or slow them down was to try and preemptively buy the cards that they needed. Now you can give them a Gossip card that may make it more expensive for them to buy the cards they need, stop them from gaining certain cards altogether, or force them to discard cards. This gives the strategy in the game a little lift and it gives you a way to buy some time to catch up if you need it. While this is a nice thematic addition as far as I’m concerned (because, let’s face it, life can really stink sometimes and people will mess with you), some people will be put off by it. The original game was great for those who don’t like any sort of “take that” or screwage in their games. 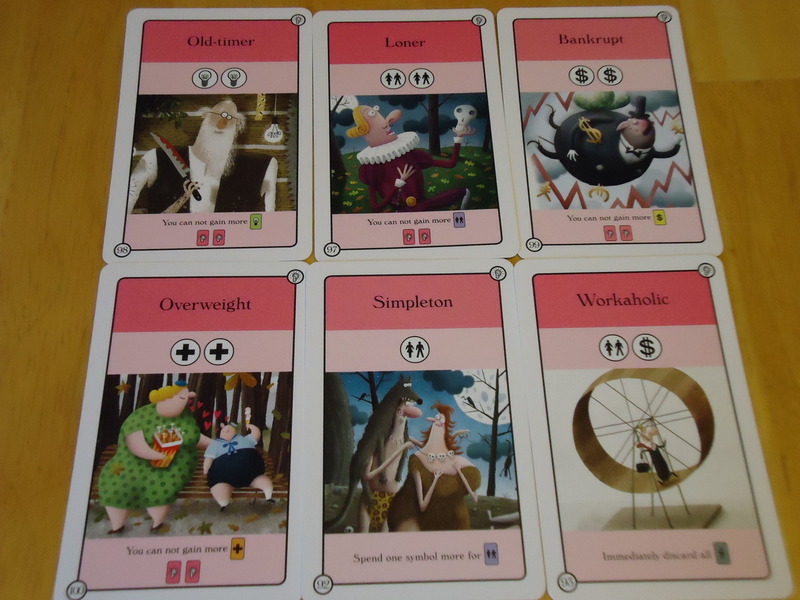 The Gossip cards change that and add a bit of nastiness, although it’s still not as ugly as some games because even the mean cards are worth points at the end of the game. You can also pretty easily cancel out a bad effect by purchasing another Gossip card to replace the one that got dumped on you. But still, it can cause hurt feelings in those who hate this sort of thing in their games. I felt that the Fate cards were more of a mixed bag. On the plus side, they give you a new way to deal with bad luck. 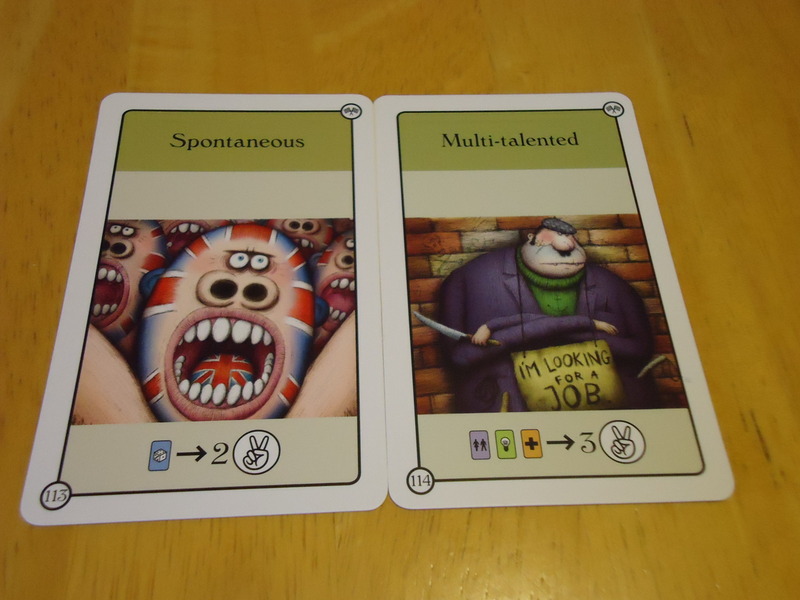 Previously, if you rolled three sad faces on the dice, you had to discard an active card from your CV. This could hurt if you didn’t have anything that you wanted to get rid of. Now, though, you can spend some of your sad faces to buy Fate cards. Whatever you spend isn’t counted when tallying misfortune. So, for example, if you rolled three sad faces and used two of them to buy a Fate card, you won’t have to discard a card. You have to weigh, though, whether taking on the ongoing effect of the Fate card is better or worse than discarding a card because most of the cards that can be bought with bad luck are pretty negative. This makes for some interesting decisions. On the more neutral side, some Fate cards are purchased using happiness symbols. These are usually positive effects but whether they are worth it over buying some of the other cards in the market is debatable. Sure, you can buy a Fate card plus your regular two cards, but your dice roll might not stretch that far. Thus, you have to choose the better option. Since Fate cards themselves aren’t worth any points, we found them to be only worthwhile (generally) if you have the associated Spontaneous Life Goal card, which gives you VP’s for every Fate card you have at the end of the game. You might find them useful in other specific circumstances, but we generally found it more cost effective to buy other cards that would definitely give VP’s at the end of the game, unless we just had a lot of dice to spend. The Fate cards will also likely run out midway through the game. This isn’t good or bad, just a fact. Because they are shifted and replaced each round even if no one buys them, they don’t last long. In a thread on BGG, the designer says that this was intentional and that “this part of the expansion is not intended to by always accessible to the players.” Unfortunately, sometimes just as your CV reaches the point where one could really be useful, they’re all gone. You have to decide early on whether or not to grab a specific card when you see it and hope you can somehow make use of it later. It’s great that the Fate cards give you a new way to mitigate some bad luck, but the rest of the options they present aren’t anything special. They can help you out in some circumstances, but overall we found them to just be an okay part of the expansion. Neither good nor bad, just kind of there. The new goal cards are a nice addition, with one specifically meant to take advantage of the Fate cards. The other one rewards you for each trio of health, knowledge, and relationship cards in your CV. While not a major addition, these do freshen up the game a bit. There were only eight goals in the base game and we played through all of them fairly quickly, so any extras are welcome. Even with the extra decisions you have to make, the expansion doesn’t add significantly to the play time. This is great because the game could already run a bit long as it was. Dice rollers should be quick and CV can last upwards of an hour. We found the expansion added only a few extra minutes, so this was perfect. And any extra time is all in the play. There’s no significant time added to the set up or tear down of the game. I only had one gripe with the components in CV: Gossip and it is minor. The cards do not have the same slick backs as the original cards. They’re sort of grainy feeling. While this doesn’t matter since the tactile feeling of the cards doesn’t give anything away when playing, the new cards do like to stick together. As I said, it’s minor but it does make shuffling and drawing a slight challenge when a few of the new cards end up together in the deck. Some people felt that CV needed a lot more cards in order to become a “great” game. I’ll agree that the limited card set can get repetitive if you play the game often, particularly over a short period of time. The cards become familiar and the jokes and stories told around the table can get a bit stale. This expansion rectifies this problem to a degree, but probably not enough for those who felt that the game needed a bigger infusion of cards. Gossip will extend the replay value a bit but it likely won’t make it into a “great” game for those who wanted a lot more cards. If, however, you felt that the base game was enough or darn close to it, you’ll likely find that this expansion is simply more of a good thing and not lament what you didn’t get. CV: Gossip does exactly what I like an expansion to do. It gives me some new play options without drastically changing the game that I liked or adding a significant amount of play time. It has boosted the replay value of the game a bit and given us a few new decisions to chew on without bogging us down in new rules. And, as a bonus, all the parts fit in the base game’s box, keeping valuable shelf space free. If you enjoyed the base game and wanted just a bit more interaction and some new ways to manage your CV, this likely warrants a purchase. If you hated the base game, there’s nothing here that will change your mind. For us, it’s a keeper. Adds some new play options without complicating the game. Play time remains essentially the same. Gossip cards increase the interaction between players. Fate cards give you a new strategy for dealing with bad luck. New goals freshen up the game a bit. Cards aren't the same texture as the original. Not a large expansion, so it won't satisfy those who were hoping for a lot more cards. 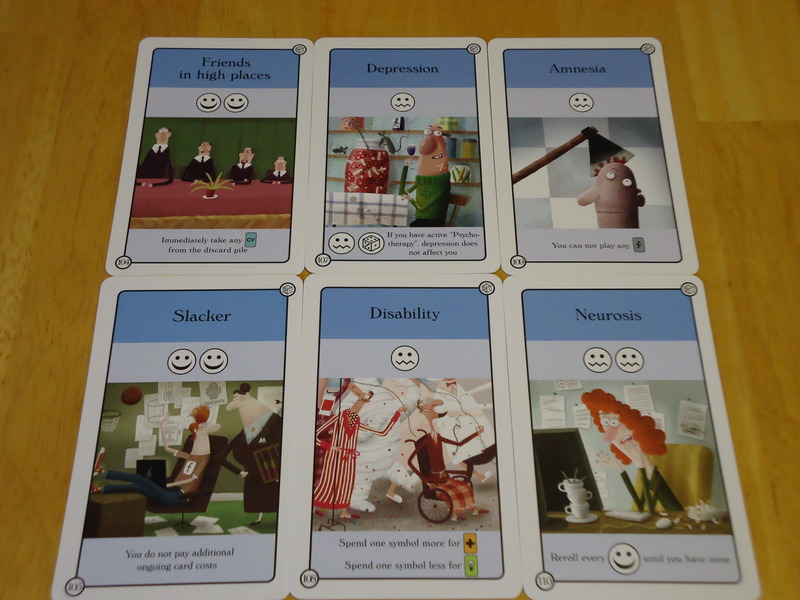 Gossip cards add a bit of 'take that' to the gameplay which may bother some.